In the process of writing and finalizing the chapter on “Visual Notetaking” for my forthcoming eBook, “Mapping Media to the Common Core,” I found Giulia Forsythe‘s blog page “Visual Practice” and her WONDERFUL presentation a year ago for the 2012 University of Mary Washington Faculty Academy. Her presentation slides are available on SlideShare, and the entire 68 minute, recorded presentation is on Vimeo. I highly recommend you watch this entire presentation if you’re interested (as you should be) in learning more about visual notes. Giulia Forsythe at Faculty Academy 2012 from umwnewmedia on Vimeo. In her presentation, Giulia cites and recommends several books related to learning, cognition, brain research, drawing and visual notes. These include the following titles, which I’ve added to my own Amazon wish list. All the above links are to the Kindle eBook versions of the respective books. Giulia also referenced “The Art of Changing the Brain: Enriching the Practice of Teaching by Exploring the Biology of Learning by James E. Zull.” Unfortunately it’s just available as a paperback from Amazon, but I found (via Google) an openly posted PDF version by a Vietnamese professor teaching in France. Not sure what the backstory on that is. Giulia’s work as a visual notetaker has been and continues to be incredibly inspiring as well as challenging to me. As a teacher and a learner, I want to have the artistic and instructional courage of Giulia Forsythe. Of the six “media products” in this first volume eBook of “Mapping Media to the Common Core,” visual note taking is definitely the one I feel most uncomfortable with and least skilled at doing. That’s exactly why I think I need to practice my visual notetaking skills more. As Giulia encourages us in this video, we ALL can learn to draw effectively, but we need practice. When I drew the icons for “Mapping Media to the Common Core,” in several instances I found icons I liked on iconfinder.net but then drew my own versions. I’ve learned this is something other artists do too. 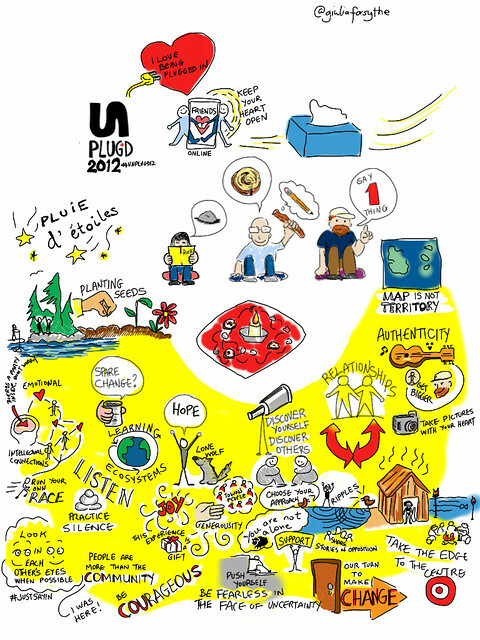 My modified icon for “Visual Notetaking” is used with permission from an amazing original Giulia created last summer at Unplug’d 2012 in Canada. 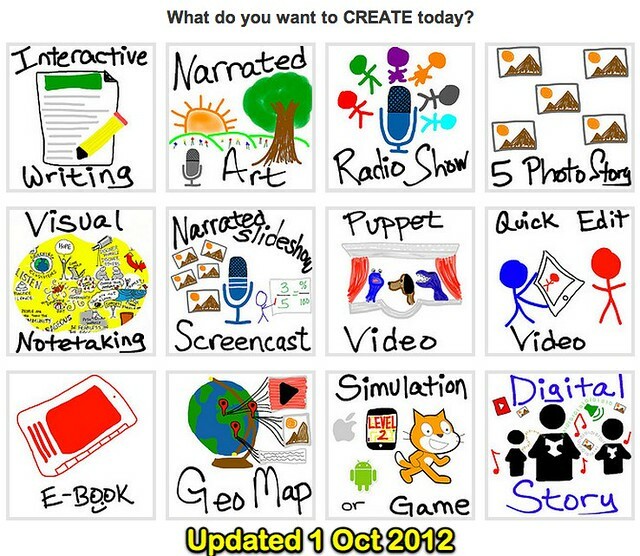 Do you take visual notes YET? 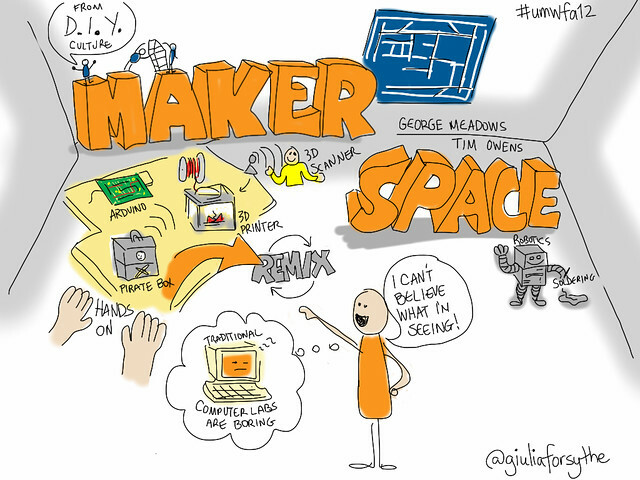 Have you taught your own students about visual notetaking or graphic facilitation YET? In addition to watching Guilia’s presentation video, check out some of the other videos and tutorials on the “Visual Notetaking” page of “Mapping Media to the Common Core.” VERY inspiring ideas to both apply personally and share with students! I have started to create a digital badge credentialing process for the media products included in the digital literacy framework, “Mapping Media to the Common Core.” Digital badging is a way to provide credit and recognition for skills learners demonstrate in different contexts. In this case, I’m wanting to use a variety of digital badges to both recognize and encourage teachers to create digital media products both individually and with their students. The first six media products for which I created entry-level (bronze) digital badges today are Interactive Writing, Narrated Art, Radio Show, 5 Photo Story, Visual Notetaking and Narrated Slideshow / Screencast. Eventually I’m going to create “silver” and “gold” level badges for these media products, along with the other six products in the framework. I’m creating these badges so they can also be awarded by others, so if you’re a teacher, instructor or professor wanting to use them to encourage your own students to develop digital literacy skills you can. There are certainly many other possibilities, but that’s what I’m thinking about for the initial phase of this. I’d love to hear your feedback and ideas. This is something I’ve been thinking about and planning for many months. To receive one of these badges, a badge-issuing organization/authority must certify via evidence (a hyperlink in these cases) that the prospective awardee has successfully met the badge award criteria. Check out my personal profile on Credly to see some examples. 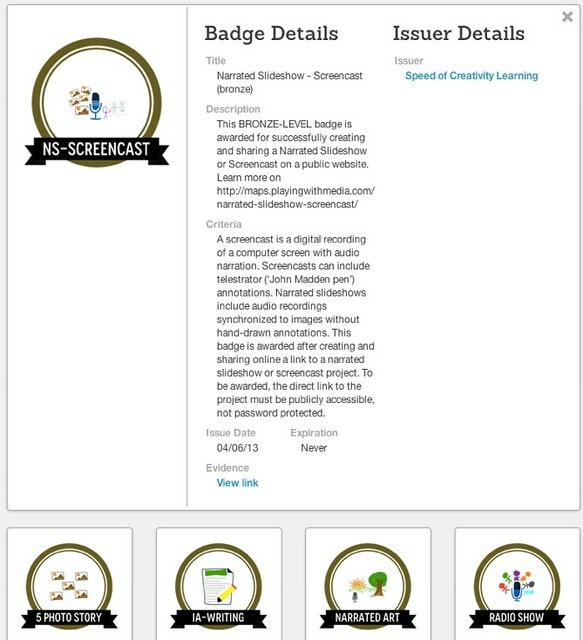 I created these digital badges using the free web tools available on Credly.com and the graphics I’d previously drawn (and remixed in one case) for Mapping Media to the Common Core. I’m thrilled Credly also offers BadgeOS, which is a free WordPress plugin. I’ve been waiting for that release since October last year at EduCause when I met Jonathan Finkelstein. Jonathan is a VERY smart guy and the founder of Credly. See my post for iThemes Education, “EDUCAUSE/ELI Badging Focus Group,” for more about what I learned then about digital badging. Also check out Class Badges, which is a different tool available (not from Jonathan/Credly) for digital badging with students. By late June / ISTE 2013 I hope to have a Credly-powered digital badging process integrated into the “Mapping Media to the Common Core” digital literacy framework, most likely hosted on the media project sharing site I setup in 2011 for “Playing with Media: simple ideas for powerful sharing.” I also hope to integrate digital badging into the student Storychasers club website we’re using at Lakeview Elementary in Yukon Public Schools using BadgeOS. Through this work I hope to help redefine digital literacy in practical ways in classrooms and communities around the world. I think digital badging holds great promise for initiatives like “Mapping Media to the Common Core,” which seeks to make the question “What Do You Want to CREATE Today?” a common refrain for learners across the K-20 spectrum.